Please join Rural Action staff, partners, members and volunteers in welcoming our eight new AmeriCorps members who began their service on August 10, 2009. AmeriCorps is a national service program through the Corporation for National and Community Service. The overall mission of the AmeriCorps national program is to serve locally and address community-based needs. AmeriCorps members with Rural Action will serve a total of 1700 hours of service in area watersheds over a 12 month period. Rural Action has developed this new Americorps program over the last year with guidance from the Ohio Community Service Council. Our members are placed with three watershed programs imbedded in Rural Action -Monday Creek Restoration Project, Sunday Creek Watershed Group and Huff Run Watershed Restoration Partnership and with three additional watershed groups; Raccoon Creek Watershed Partnership, Moxahala Watershed Commission and Leading Creek Watershed. During the planning process, a local community advisory group identified several environmental issues for communities within the designated watersheds including restoration of acidic streams, clean-up of illegal litter and trash dumps, loss of healthy wildlife and riparian habitat including agricultural impacts and poor vegetative buffers, pollution from sewage including raw sewage entering the streams and agricultural farm waste, stream sedimentation and creating education and outreach opportunities for youth in the region. 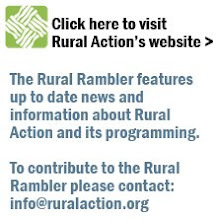 For Rural Action’s new Americops, these needs serve as the focus for their work. They will assist in providing activities related to improving water quality and community support for the watersheds. They will be involved in water monitoring, data entry and analysis, community outreach activities, tree plantings, canoe floats, stream sweeps, fundraising and grant writing for projects and much more. Rural Action's long history with the Corporation for National and Community Service and another AmeriCorps program, AmeriCorps*VISTA (Volunteers In Service To America) has been a fruitful collaboration for local citizens and Rural Action for many years. Over the course of the last 15 years more than 350 VISTA members have served in excess of 600,000 hours of service in southeastern Ohio. As Rural Action's VISTA program concludes this December, we look forward to great success with our new AmeriCorps State service program. We wish all of our new members a productive, educational and inspiring term serving the people of Appalachia Ohio.